From October 31 to November 1, the Charlotte Convention Center in North Carolina will be home to this year's RK Motors Collector Car Auctions, with five of the most historic race cars in recent history going to the block to be taken home by lucky bidders. Many of the cars have never been in private hands before this point. One of those cars is the 1977 McLaren M26 that was driven to by race legend James Hunt to his final victory in Formula One. This car will be auctioned live via satellite from the 7-star Emirates Palace Hotel the night before the Abu Dhabi Grand Prix. 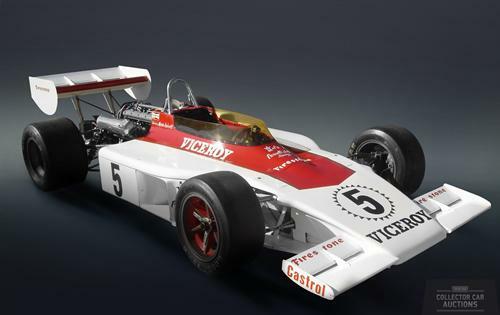 Coming closer to home, how about the 1974 Viceroy Gurney Eagle (pictured) driven by the beyond legendary Mario Andretti during the 1974 season, including in the Indianapolis 500, earning the driving master a USAC National Championship third-place finish in Phoenix. That car has been completely restored to F1 Indy 500 specs with its 1,000+ horsepower Offenhauser engine and Eagle-cast Magnesium wheels on Chassis #74-06. This is the first time the car has ever been auctioned. If F1 isn't your style, there is another legend driven by a legend from NASCAR on the block. The 1977 Chevrolet Nova that took the checkers at Caraway, Daytona, Rockingham and Charlotte during the 1982 and 83 seasons, driven by one of the most well-known drivers in motorsports history, Dale Earnhardt Sr. Badged with Sr's father Ralph's signature #8 and the GM Goodwrench color scheme so well-recognized, the car was converted into a better-drafting Nova by Earnhardt and Robert Gee for the 1986 season opener Goodys 300 at the Daytona International Speedway, where it won yet again. The Nova has also participated in three Goodwood Festival of Speed events in England and underwent a complete paint and mechanic restoration for last year's Rolex Monterey Historics at Laguna Seca. This working race machine will be up for auction in Charlotte. If that's not good enough, how about a car driven by the only man to win the Indy 500, Daytona 500, 24 Hours of Daytona, 12 Hours of Sebring, and 24 Hours of LaMans? Yes, A.J. Foyt, the most-recorded man in motor racing, drove a 1978 Chevrolet Camaro on his last victorious championship drive and it will also be at the RK Motors event in Charlotte. Foyt drove this Camaro to no less than five victories in 1978. The next year, the Camaro returned and Foyt drove it to back-to-back nightly victories at the Fair Stock 200 and Milwaukee Mile and then the next night took yet another flag, Foyt's last victory, on the dirt at Springfield Mile. Speaking of off-road, the auction in Charlotte will also feature the 1994 Toyota PPI Trophy Truck 015, which won four Baja 500 and a Baja 1000 win when driven by the unforgettable Ivan "Ironman" Stewart. Stewart needs no introduction as the champion of champions in baja rally running. The truck came out of an alliance between Toyota and Precision Preparation Inc, featuring a 302 cubic inch V8 with an off-track speed of 135 mph.